Rancher Cliven Bundy speaks during a news conference near his ranch April 24, 2014, in Bunkerville, Nev. The Bureau of Land Management and Bundy have been locked in a dispute for a couple of decades over grazing rights on public lands. But off the record, some Republicans have gone further, expressing frustration with the series of verbal missteps, particularly pertaining to race, that have hampered the party’s aggressive efforts to recruit more racial minorities. This past year, the RNC not only hired more African-American staff members in its quest to diversify but has also been aggressively courting Republican candidates of color, resulting in 11 black Republican candidates—a record number—slated to run in Alabama in upcoming elections. But many of these efforts have been overshadowed by high-profile incidents of conservatives making unsavory comments about race. Considering how dismally the GOP has fared among black voters in the last two election cycles, some may wonder why it’s bothering to woo black voters at all. The answer is simple: The Obama era is almost over, and previous elections, before the history-making first African-American president was ever on the ballot, indicate that some black voters are willing to vote for Republicans when given a good reason to do so. Black voters in Ohio voted for George W. Bush in double digits in 2004. The result? Bush won the state over John Kerry and ultimately won the election. Another reason for Republicans to be optimistic is that polling has shown that younger black voters of the post-civil rights generation are more likely to identify as independents than their parents, who tend to identify as stalwart Democrats. This was one of the findings of the national poll conducted for my book, Party Crashing: How the Hip-Hop Generation Declared Political Independence, in 2007. Many of those voters may have felt a measure of loyalty or inspiration from President Barack Obama, whom they helped make history. That doesn’t mean they’ll be Democratic loyalists for life. So it’s not an unrealistic goal for Republicans to believe they may be able to court and, ultimately win, some—not all, but some—of these voters. But that will remain tough to do when people like Bundy, a conservative folk hero who initially attracted the support of a number of major Republican figures—like Kentucky Sen. Rand Paul, who’s a leading 2016 presidential contender—goes out and makes racially offensive comments. 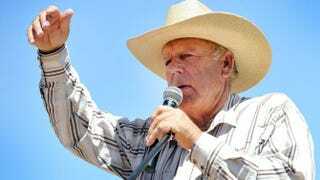 And Bundy is far from alone: I have written extensively about the many missteps on race that Republican elected officials, candidates and activists have made over the last few years. The question becomes, can the GOP really ever reinvent itself as a party of diversity and inclusion, when a number of those already included in the party clearly do not believe in those principles, even if its leaders, like Priebus, do?